It’s 3 a.m. on Nov. 30 in San Francisco. Riot cops just raided Occupy Philly and Occupy Los Angeles tonight and the live streams are running on my laptop. We are preparing for a possible raid of Occupy San Francisco tonight or tomorrow. I’m talking back and forth with other occupiers and labor, community and faith allies, deciding whether to call for a mass mobilization tonight and to prepare for mass civil disobedience. On the same date twelve years earlier thousands of us got up before dawn to blockade and shut down the 1999 World Trade Organization meeting in Seattle. As dusk fell the city declared a “state of emergency” in the downtown section of the city and drove people out with volleys of teargas and charges of riot cops. The next day, Dec. 1, thousands of us defied their martial law and took to the streets and hundreds were arrested and attacked. People stayed in the streets all week until Dec. 3, when the WTO talks collapsed as representatives from poor countries, bolstered by public rebellion in the streets and pressure from movements in their home countries, refused to buckle under. It feels like a similar moment now with political space and possibility breaking wide open — a time of public and global uprising — only bigger. On Monday I was at University of California Davis as students and workers defiantly took over the University of California Regents Meeting at Davis (and simultaneously at other campuses) with a “People’s Regents Meeting” facilitated as a directly democratic general assembly which the two Student Regent representatives participated in — while outside the meeting other students occupied the Hahn administration building overnight. In England millions of public sector workers are striking. In Egypt port workers refuse to unload shipment of tear gas from the United States. On Sunday we met to develop a plan for mass action in San Francisco’s financial district in January. This Saturday an Occupy Housing mass march and actions will mark a deepening of the occupy movement in our city, as well as the powerful involvement of tenant and homeowner groups from four neighborhoods — Bayview, Castro, Mission and Tenderloin — will take action with their neighbors facing foreclosure or eviction against the neighborhood branch of the big banks that profit from evictions and foreclosures. Then all four groups will converge on Occupy San Francisco in the financial district (nicknamed for many decades, “Wall St. West”) for a mass march and action. As the occupy movement grows, wrestles with how to organize and looks forward, perhaps it’s of use to look back to what did and did not work in the space opened up 12 years ago — the global justice movement of movements that followed global South movements and spread across North America in the wake of the Seattle WTO mass occupation of downtown Seattle and nonviolent direct action shutdown of the WTO. I was living in Seattle and organizing with the Direct Action Network in the fall of 1999 through 2000. For myself and tens of thousands of activists the event was a high point in social-change-movement organizing. I had been involved in many of the movements that fed into Seattle: anti-sweatshop organizing, Earth First! forest campaigns, antiwar and anti-sanctions on Iraq organizing, anarchist community and movement building activities, and the ‘98 and ‘99 global justice days of action kicked off by Britain’s Reclaim the Streets and coordinated by the Zapatista-initiated People’s Global Action. “Seattle,” shorthand for the 1999 anti-WTO mass actions, was a moment when organized protest and resistance became a genuine popular uprising of thousands of ordinary people who successfully shut down the opening day of the WTO meeting, took over and occupied the downtown core of a major American city, and contributed to the collapse of negotiations that would have increased poverty, destruction, and misery around the world. “There were those who were saying they would shut down the city of Seattle, and they managed to do that today,” Seattle Police Chief Norm Stamper said to the Seattle Times on Nov. 30. On November 30, 1999 a public uprising shut down the World Trade Organization and took over downtown Seattle, transforming it into a festival of resistance. Tens of thousands of people joined the nonviolent direct action blockade which encircled the WTO conference site, keeping the most powerful institution on earth shut down from dawn till dusk, despite an army of federal, state and local police shooting tear gas, pepper spray, rubber, plastic and wooden bullets, concussion grenades and armored vehicles. The Washington National Guard’s 81st Infantry Brigade, 1-303 Armor Battalion, and the 898th Combat Engineer Battalion was deployed. People continued to resist throughout the week despite a clampdown that included nearly 600 arrests and the declaration of a “state of emergency” and suspension of basic civil liberties in downtown Seattle. Longshore workers shutdown every West Coast port from Alaska to Los Angeles. Large numbers of Seattle taxi drivers went on strike. All week the Fire fighters union refused authorities requests to turn their fire hoses on people. Tens of thousands of working people and students skipped or walked out of work or school. People across the globe took action in solidarity. In India, thousands of farmers in Karnataka marched to Bangalore, and over a thousand villagers from Anjar in Narmada Valley held a procession. Thousands took to the streets in the Philippines, Portugal, Pakistan, Turkey, Korea, and across Europe, the United States and Canada. 75,000 people marched in 80 different French cities and 800 miners clashed with police. In Italy, the headquarters of the National Committee for Bio-Safety was occupied. In the period leading up to the WTO Ministerial resistance increased; an occupation of the WTO world headquarters in Geneva; Turkish peasants, trade unionists and environmentalists marched on the capital of Ankara; a street party shut down traffic in New York City’s Times Square; activist’s took over US Trade Representative Charlene Barshefsky’s offices; and 3,000 workers and students rallied in Seoul, Korea. Thousands of activists continued to engage in nonviolent direct action throughout the week, despite a clampdown that included nearly 600 arrests, continued tear gassing and police rioting, the declaration of a “state of emergency,” and suspension of the basic rights of free speech and assembly in downtown Seattle. Much of the corporate media tried to dismiss the public uprising of tens of thousands of people that had tapped into popular anti-corporate sentiment, by focusing on the spectacle of a few dozen “black bloc” participants who broke corporate chain store windows well after the blockades had already shut down the opening of the WTO, after thousands had taken over occupied downtown Seattle, and after the police had begun using teargas, pepper spray, and rubber bullets. The cops and politicians also tried to use broken windows to justify their repression and brutality. Despite this, a month later, in January 2000, an opinion poll by Business Week found that 52 percent of Americans sympathized with the protestors at the WTO in Seattle. Since the Seattle WTO shutdown, police, government authorities, and corporate media have characterized major political mobilizations in the United States and internationally as potential recurrences of the “violent riots” that supposedly occurred in Seattle. 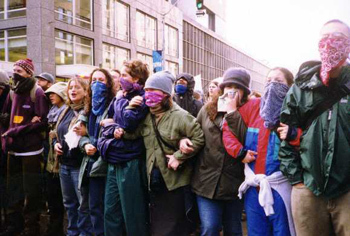 In the lead-up to mass demonstrations against the 2000 Democratic National Convention in Los Angeles, for instance, police agencies produced a video that combined images of activists at the WTO in Seattle breaking corporate chain store windows, with marginalizing clips of some Eugene activists who had allowed 60 Minutes and other corporate media outlets to do extensive features on them as “Eugene Anarchists,” as one way to help the public dismiss what had happened in Seattle. Police showed the video to the Los Angeles City Council just before a vote on funding a massive police presence and new riot gear to counter the demonstrations. The Council was scared, and the funding measure passed. The NYPD’s history of Seattle included completely fabricated references to overturned police and emergency vehicles. The report provides a long list of terrorist attacks around the world together with a list of international grassroots global justice, peace, and other mobilizations, suggesting the latter was indistinguishable from the former and that they were both threats that justified repression. Several years after the Seattle actions, a group of us calling ourselves the People Powered Strategy Project reflected on the key elements that made the one-day mass urban action and week of struggle in Seattle successful. We came up with the following principles in an effort to bring a people-power strategy to the antiwar movement, which had none after the United States invaded Iraq in 2003, and I have added a few more. These same principles worked in San Francisco on March 20, 2003 — the day after the U.S. invasion of Iraq — when 20,000 people from the area shut down and occupied the Financial District, 2,000 of whom were arrested. 2) Broadly Publicized: Lead-up actions, press conferences, a widely-distributed broadsheet newspaper, nearly 100,000 full color postcards, a massively visited website, widespread emailing of our call to action and action info, a West Coast performance/education/training road show and broad regional and North American mobilizing made sure many people knew what was planned, why, and how to prepare and plug-in. 3) Mass Training and Mass Organization: Thousands of people received nonviolent direct-action and related trainings in the days and weeks leading up to the action and in communities up and down the Western U.S., and well over 1,000 people were directly involved in organizing through affinity groups and clusters, working groups, and public meetings. The Direct Action Network was initiated by a network of local grassroots West Coast activists and was able to involve many varied segments of the movement — students groups, nonprofits, environmentalists, community organizers, labor organizers and members, and a wide range of activists and concerned folks. 4) Decentralization: A wide range of participating groups and individuals helped to shape, understand, and support the basic strategy and agreements. At the core of the action were self-reliant affinity groups who organized into clusters, thus the core action participants were well-organized, able to be flexible and make quick decisions, and respond easily to changes. This meant that the action was less vulnerable to repression or disruption, for example, if key organizers were arrested. Additionally, many like-minded groups and individuals who had no direct contact with our organization understood and supported the basic strategy, and participated in the action without ever coming to an organizing meeting. 5) Media and Framing: Direct Action Network aggressively communicated in plain language to participants, movements, and the public through our own printed materials, website, emails, road shows, and to both independent and corporate media what we were planning, why and what was wrong with the WTO. 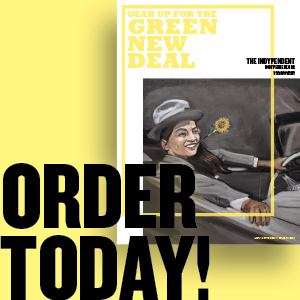 • Distributing nearly 100,000 outreach postcards and 50,000 broadsheet newspapers with in-depth articles to potential participants and supporters. • Numerous cosponsoring groups communicated with their own members, communities, and networks. • Holding educational road shows; a People’s Global Action caravan bus made stops in cities across the entire country — from New York City to Seattle — doing outreach events and media work as they went. • Art and Revolution street theater troupe traveled from Central California to British Columbia giving popular education performances, direct action and theater trainings, and doing media about issues around the WTO, corporate globalization, and the global movements of resistance. • Indymedia and hundreds of independent media journalists and outlets covered the events as they unfolded. Many, many participants also did their own media, writing accounts, taking photos and video, sending them out through email networks, independent media outlets, and face-to-face report backs and storytelling. • DAN held press conferences, sent out press releases, made spokespeople available, and aggressively engaged independent and corporate media in order to assert our views and perspectives before, during, and after the anti-WTO actions. Because of this major effort to tell our story, and despite corporate media efforts to weaken public support for our direct actions, a month later, a January 2000 opinion poll by Business Week found that 52 percent of Americans sympathized with the protestors at the WTO in Seattle. Too often, a healthy, radical critique of the corporate media leads to groups deciding to not even try to engage with them, standing by while they get beaten up in the mainstream press, and sometimes not even making the effort to communicate through independent media or directly through their own media and outreach. Yes the corporate media, like the police, are in part instruments of control, but would you stand by and not protect yourself against a cop’s club, because their authority is illegitimate? 6) Open Organizing: The decision had been made early on to organize openly, as mass nonviolent direct actions had been for many years. This was a learned response to government efforts to infiltrate or disrupt past mass actions and movements, such as the FBI’s Cointelpro efforts to destroy the New Left, civil rights, and anti-Vietnam war movements. If a group’s plans for mass actions or demonstrations are public and open, it is less vulnerable to government infiltrators or informants and its plans are not ruined if they are found out. It also makes group members less susceptible to the goal of government disruption, which is, in the words of one FBI Agent quoted by Brian Glick in his excellent writings on how to deal with infiltration and disruption, “to make activists think there is a cop behind every telephone pole.” Our basic plan, to march on and blockade the WTO on the opening morning of their Ministerial, was very public, printed on tens of thousands of outreach postcards and broadsheets, and even on the front page of the Seattle Times. Keeping planning secret goes against the need to attract and involve large numbers of people, to have open democratic decision-making, which seems to be essential in getting large numbers of participants who are informed and empowered. Small self-reliant affinity groups of five to 25 people were the basic planning and decision-making bodies of the action, and their decentralized planning within the larger strategy did create an element of surprise. They formed into thirteen or so clusters to take on blockading the thirteen “pie slices,” that downtown Seattle around the WTO had been divided into and some remained mobile. How each affinity group or cluster would blockade was an element of surprise, as groups were autonomous to do it as they chose. 7) Action Agreements: The groups and activists of the Direct Action Network knew it would take a diversity of participants — thousands of people from different groups, movements, and traditions — to shut down the WTO. We made some basic agreements early on about what types of mass action would best shut down the WTO and would create a space that could involve a wide diversity of participants, because we would need hundreds or even thousands to shut down the WTO. We agreed that the direct action blockades would be nonviolent, and would not include property destruction (except for moving objects as blockades). We agreed that we would organize ourselves in affinity groups who would coordinate in a spokes council and that we would support and prepare for jail solidarity. Voluntary agreements are the foundation of any collective project and are the basis of trust for alliances of different people and organizations. In the wake of Seattle, parts of the anarchist and anti-capitalist scene adopted and strongly promoted a “diversity of tactics” framework, which in practice means refusing to discuss which tactics are or are not strategic and refusing to make agreements about which tactics would or would not be used. It was seen as a pushback against the rigidity of “nonviolence” with all its baggage, allowing more space for property destruction and street fighting with — or fighting as self-defense against — cops. Most movements around the world, nonviolent or not, discuss strategy, make agreements about which tactics are strategic, and organize to follow those agreements. Where diversity of tactics has replaced action agreements in the Unite States, the effect has been that mass direct actions are less massive, less strategic, less frequent, with less public support, and more vulnerable to infiltration, repression, and corporate media distancing the public, and the alliance of groups and constituencies participating have become narrower. I think the Occupy movement could answer that.